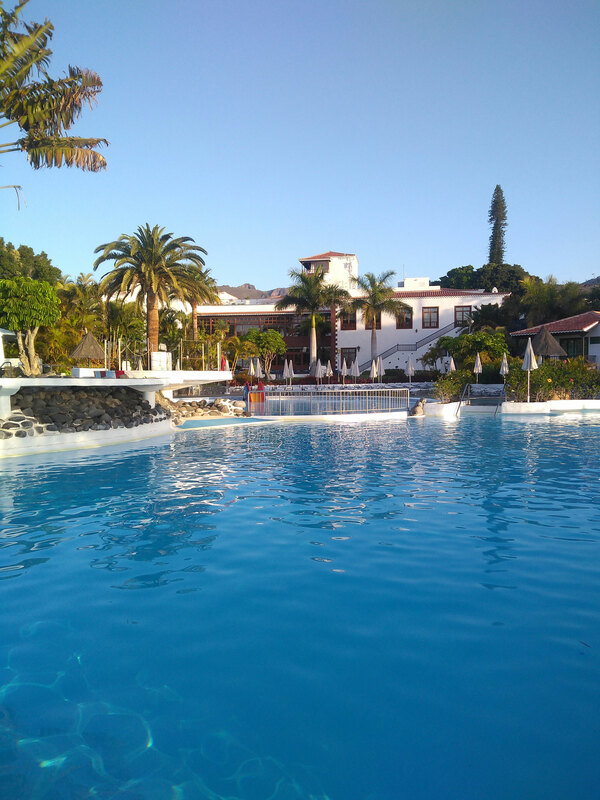 Travel Specialist, Lucy Newman, recently visited our laid-back resort in the Canary Islands for the first time. Here is what she thought of her stay. Flying from Stansted, I arrived in Tenerife with a couple of hours to spare before taking the Fred. 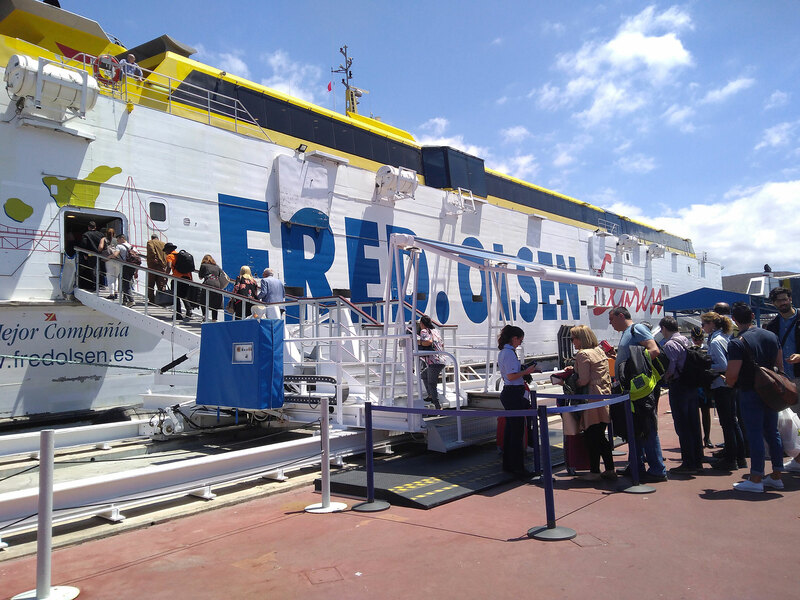 Olsen Express ferry to La Gomera. The transfer from the airport to the port took around 20 minutes. After leaving the luggage in the lockers next to the dock (there is a free option and payable option of €1 if you have anything valuable to store), it was only a five-minute walk to Los Cristianos. From here, you can walk around the promenade, stop for a drink and a meal or even relax on the beach. Back at the ferry port, boarding was very efficient and there was plenty of seating indoors and outdoors. Snacks and drinks are available to purchase but it was nice to just sit back for 50 minutes and take in the views of dolphins playing in the waves. Once we arrived, it was just a short 45-minute transfer to the Hotel Jardín Tecina. The drive from San Sebastian port to the quaint village of Playa De Santiago was one of the most scenic journeys I have taken, with twists and turns climbing high in the mountains and far-reaching views of the lush green landscape. Many people choose to hire a car and take time to stop-off at various viewpoints along the way; the roads are not crowded and the pace of life slows as soon as you reach the island. On arrival at the hotel, which is a low rise village-style resort sloped on a cliff, I entered the recently refurbished lobby and immediately checked in to a Comfort Room for two nights. The lobby itself was light and airy with muted tones of blue, yellow and beige furnishings set around a central bar. As I only had a small suitcase, I carried this to the room but for those who are located further away from reception or who have larger suitcases, there are staff on-hand to bring these to the room for you. My Comfort Room had a balcony with partial sea view looking over the rooftop of the next set of 'villas', and with expansive views of Mount Teide in Tenerife. The rooms are very spacious and feature large twin beds that can be converted to a double bed, a bathroom with bathtub and overhead shower, and a good range of extras including bathrobes, hand cream and lip balm. In Superior Rooms and Junior/Duplex suites, you will also have tea and coffee making facilities including an illy coffee machine. I was staying on a half-board basis, which I can highly recommend as the food is a very good standard and made with predominantly local ingredients from the hotels own garden ‘Eco Finca’. Buffet meals are included, however, I visited the Tasca Fandango tapas restaurant and El Laurel Canarian restaurant - both of which had a relaxed candlelit setting, live music and a comprehensive tasting menu for a supplement of €9.90 per person. The following morning was spent travelling by hire car to the Garajonay National Park, where there are numerous hiking trails in an ever-changing landscape of rainforest and desert conditions. I can highly recommend hiring a car at the hotel for a few days, as the roads are very well kept and driving can be done at a slow pace to appreciate the scenery. For those who would rather not drive, the hotel arranges a daily hiking program as well as other sea/land excursions and electric bike hire. 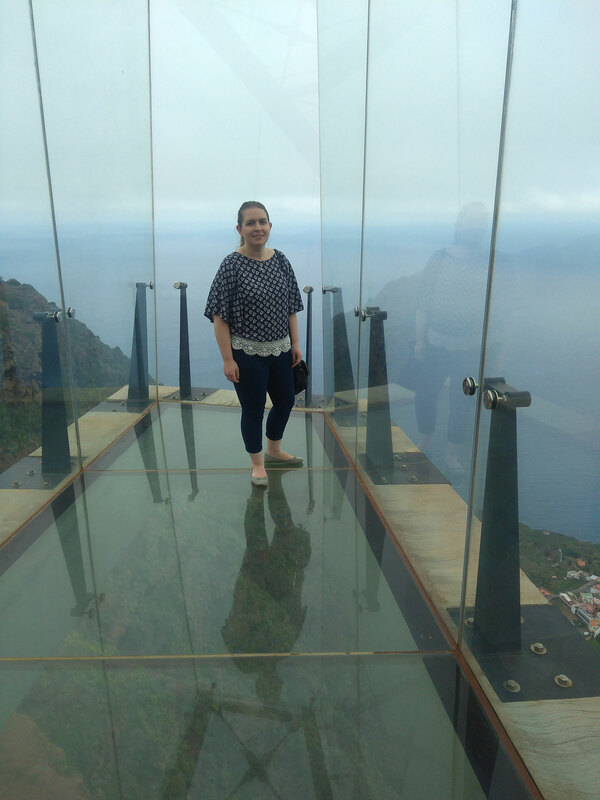 In the afternoon, I visited Mirador De Abrante, a unique restaurant surrounded by red rock and with a glass walkway jutting off the cliff edge. The food here is tapas style and very enjoyable with floor-to-ceiling windows looking out to the ocean. I also got to hear the unique whistling language from the locals which is used as a means of communication on the island and is still taught in schools today. Late afternoon back at the hotel, I met the hotel guide who showed us the various room types. We started with the Duplex Rooms, located at the top of the resort and each spanning three floors with internal staircases connecting two bedrooms and a large sun terrace with a day bed. Soon to be adults only, the suites are surrounding a private pool area with cabanas and Jacuzzis. This haven is completed when, at the touch of a button, a waiter will bring drinks from the bar without you having to leave your cabana. Other room types include Large Junior Suites with separate lounge area, Superior Rooms with sea views located close to the cliff edge, and secluded Standard Rooms with a garden view. The gardens have a wide range of flora and fauna and are kept immaculate by seven gardeners. I could definitely recommend this hotel as a wellness retreat after the recent addition of the spa. Spa treatments are varied and reasonably priced at €60 for 50 minutes. The spa itself has a sauna and steam room on the lower floor and outdoor spa pools on the upper floor along with cabanas and a bar area. The outdoor spa is priced at €10 per person for two hours or €20 per person for a whole day. There is a range of sports activities available too, ranging from a championship 18-hole golf course to a tennis academy. 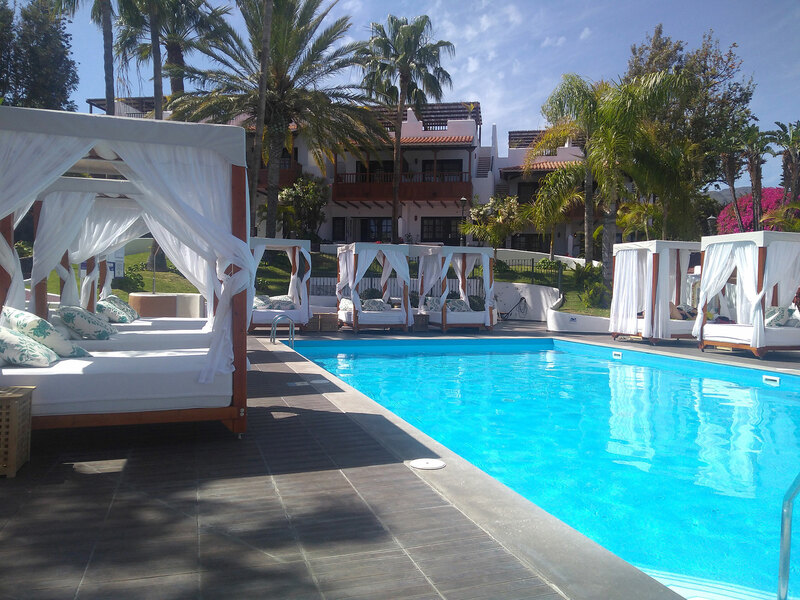 There are five pools spread throughout the resort, including a saltwater pool at Club Laurel, located down a lift by the beach leading to the village of Playa De Santiago. As the resort is very spaced out, it never felt busy. You could easily find a sun lounger and a table outside with a view at breakfast. There is something for those who want to relax and anyone who wants to be active, and there was nothing more enjoyable than walking around the resort saying hello to fellow guests and enjoying the scenery. If you would like to book your own stay at the Hotel Jardín Tecina, call us on 0800 035 0704. We have some great early booking discounts for you to take advantage of.